OSWEGO, Ill. - March 13, 2018 - PRLog -- Like most children, my daughter loves holidays. Especially holidays that include gifts and candy! Making Easter a pretty big deal at our house. But after 30 years of dying Easter eggs in same little colored bowls, I thought there must be a fun creative way to spruce up these Easter eggs. After a little research and some input from a certain energetic and opinionated 9-year-old. 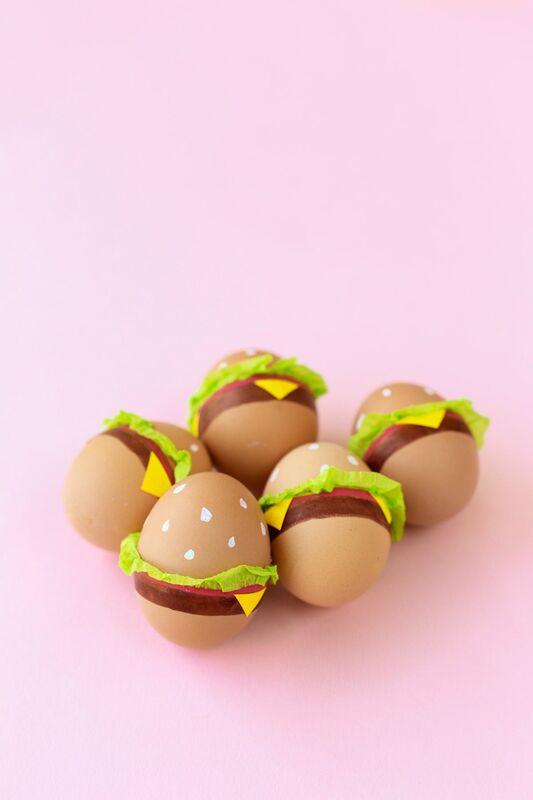 This are our top picks for awesome, crafty, and innovative Easter eggs. 1. Draw a brown stripe around the lower third of the egg. Let dry for about one minute. 2. Draw a red stripe just above the brown one and let dry again. 3. While drying, cut three tiny triangles (per egg) out of yellow paper. 4. Glue the triangles onto the egg, spacing them evenly apart around it. 5. Cut a skinny strip of your green streamers, long enough to fit around the egg plus some. Run a line of glue around the egg and then glue the strip to the egg, "ruffling" it as you go by folding over and gathering the streamers in some places as you adhere it. Let dry. 6. Draw white "seeds" on the top half of the egg and let dry. Step one: carefully puncture the top of the egg with a sharp object. You will need about a 1/2 inch hole to fill the eggs. I used a kabob skewer to crack the eggs and gently mixed the egg yolk to help release it from the shell. Wash hallowed eggs thoroughly with soap. Step two: dye eggs with kit or 1 cup water, 1 tbsp vinegar, and food coloring. Allow eggs to dry. Step three: fill eggs with confetti. Step four: cut a 3/4 inch square of tissue paper and glue to cover the hole. 1. Bring one inch of water in a large pot to a boil. 2. Set eggs in a steamer basket and lower into pot. 3. Cover pot with lid and set timer for 13 minutes. 4. Remove lid and take steamer basket out of the pot. 5. Immediately place eggs in a bowl of ice water. 6. Allow to cool for at least 20 minutes. 7. Meanwhile cut carrots into slices and sticks. 8. Cut the slices using a small "E" cookie cutter (2 per egg). 9. Cut the sticks so that each end is pointed (2 per egg). 10. Push a skewer into the center of each "E" creating a hole. 11. Poke a carrot stick into each "E" creating a chicken leg and foot. 12. Remove eggs from ice water. 13. Poke two carrot chicken legs into each egg. 1. I started with a glob of hot glue on the bottom of the egg and then slowly wrapped the jute in a circular motion. My suggestion is to only use a tiny bit of glue and work with a 1″ piece of jute at a time. If you use too much glue it will seep through. 3. And to top things off, I added a few pieces of vintage ribbon, lace and a jute bow to give it a shabby chic look. I am very fortunate and I actually have all of my grandma's old ribbon and lace from when she was young. So yes, mine is authentic! Step 1: Insert a long needle into the bottom of each egg; make a small hole, then make a slightly larger one in the top. Step 2: Move the needle around inside the shell to break the yolk. Step 3: Blow over the smaller hole — feel free to use a straw if you don't want to touch the egg directly — until the liquid drips out of the larger hole. Step 4: Run the egg under water. Blow the water out, and let the shell dry overnight. Step 5: After coloring the egg, attach fabric scrap-booking flowers with tiny dots of glue. Lightly press each flower with your finger, then release. Well you better get hopping if you want to have the most creative and fun Easter eggs on the block. Hopefully our top picks give you and your children hours of Easter fun. Happy Easter from your friends at Temple Display. https://www.templedisplay.com/ 1-800-722-2501 Your source for commercial holiday decorations!